While my assumption was that the genetic matching with the Snell family was due to Helen’s father possibly being a Snell, another very real possibility was that the relationship was through Walter A. Snell instead of Helen. This seemed especially likely in view of how quickly Helen married Walter after her first husband’s death. Were Helen and Walter already intimately involved prior to Frank’s death? Could they have been involved in July of 1915 when Helen’s son (my grandfather) was conceived? I’ve done a lot of Y-DNA testing. STR testing, SNP testing, Full Y, Geno 2.0, 23andMe, Y-Seq, you name it. At no point did I think anything was out of the ordinary, nor did I have a Snell match. But that doesn’t prove anything. 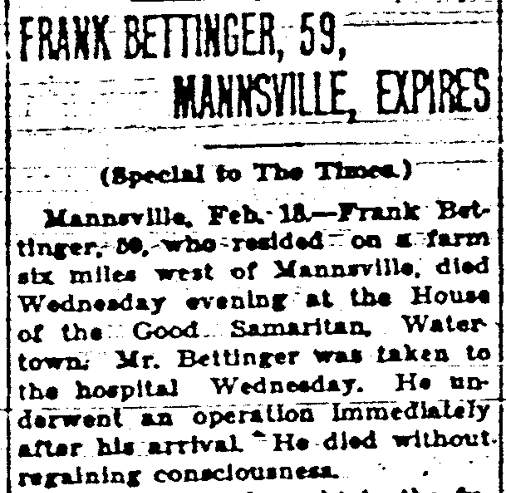 You can see Frank Bettinger – husband of Helen Johnson and my great-grandfather – in dark red in the graphic. When the results came back, we were a very close Y-DNA match, having a genetic distance of just 2 (one fast marker and one slow marker). Additionally, there is autosomal DNA sharing between these two lines, with a fifth cousin once removed (5C1R) relationship between the two lines sharing a 17 cM segment on chromosome 15. Although not definitive, the autosomal DNA matching and Y-DNA matching align well. 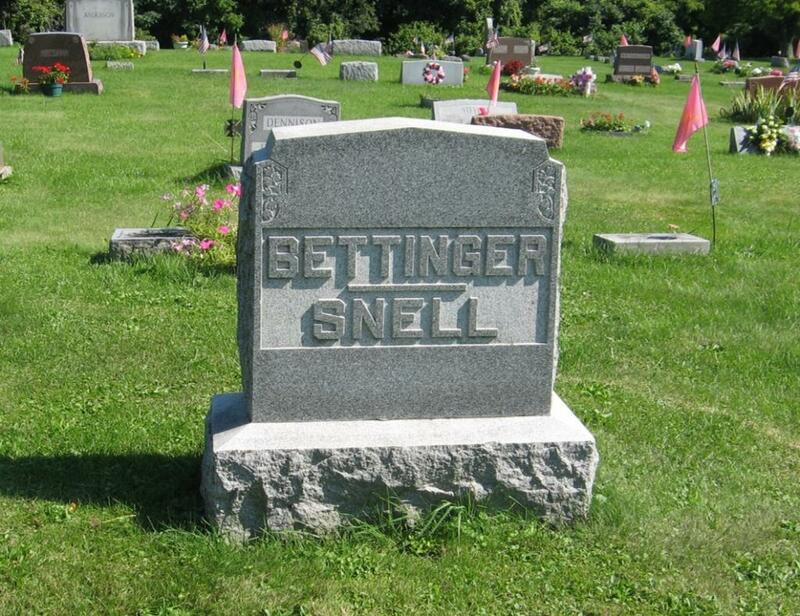 So no, I don’t have Snell Y-DNA. So if we continue with the hypothesis that Helen’s father was a Snell, can we come up with some possibilities about who he might have been? The variety of descendants makes for a compelling hypothesis. For example, Match #1 is closest to the two Bettingers genetically (and genealogically, according to this reconstructed tree), while Match #2 and Match #3 are a bit more distant, and Match #4 is the most distant genetically (and genealogically, according to this reconstructed tree). This leads me to think that Edmond Cooley Snell is Helen’s grandfather, rather than another brother or sister of Edmond and Sylvester. Helen’s father, therefore, could very likely be a child of Edmond Cooley Snell. Based on my preliminary research, Edmond Snell married twice and had nine children, six with his first wife Sophronia Parmelee and three with his second wife Mary Roberts. If Helen’s father is a child of Sophronia Parmelee, he will be a full sibling to Mary Elizabeth Snell and Julia Snell. 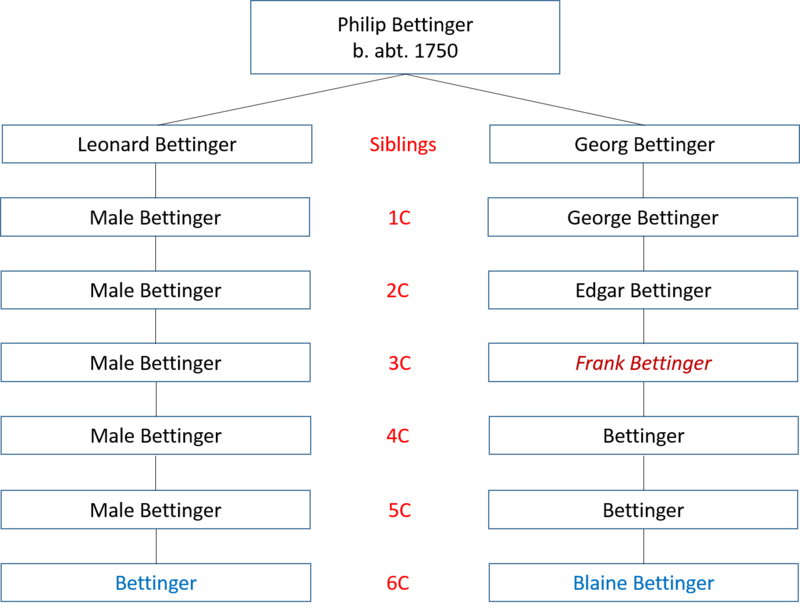 The two Bettinger test-takers would then be third cousins (3C) with Match #1, and third cousins once removed with Match #2 and Match #3. If Helen’s father is a child of Mary Roberts, he will be a half sibling to Mary Elizabeth Snell and Julia Snell. The two Bettinger test-takers would then be half-3C with Match #1, and half-3C1R with Match #2 and Match #3. Reading the Chart: For example, for Match #1, the relationship could be either 3C or Half-3C. 3C should share about 53 cM in common, and Half-3C should share 27 cM in common. Bettinger test-taker #1 shares 90 cM with Match #1, and Bettinger test-taker #2 shares 44 cM with Match #1. For each of Match #1 through #3, the results for both Bettinger test-takers suggest that the relationship is not a half relationship but a full relationship, and thus that Marley’s grandmother might have been Sophronia Parmelee. Unfortunately, all of this research is far too preliminary – and the DNA evidence not conclusive enough – to preclude Edmond Snell’s second wife Mary Roberts as the grandmother. Hopefully with additional evidence, either paper trail or DNA, we will have more conclusive support for one possibility over the other. In the next post, we’ll look at Edmond Cooley’s four sons and who could have been Helen’s father. What were they doing in the summer of 1888 when Helen was conceived? And if there’s time, we’ll examine the possibility that Helen might have known her biological heritage. Although cousins have frequently married throughout history, it was usually because they knew they were cousins; they interacted with each other and/or lived in the same town. But if Helen was indeed biologically a Snell, and if she didn’t know it, what are the odds that she randomly reclaimed a birthright she was denied and randomly lived with her biological surname for the last 50 years of her life? What are the odds that the surname carved into Helen’s gravestone for eternity randomly could be the surname she should have been born with? Of slight genealogical interest to you, but reaching way back for a FAN group, my ancestor Joh: Nicolaus Kolsch was a baptismal sponsor 31 July 1778 for your cousin Johan Philipp Bettinger, recorded in the German Flats Ref’d. Church. I have discovered no connection between the infant’s father and my ancestor except their mutual service in the 1st NY Regiment (Continental, Van Schaick) and at least short-time rsidence in the German Flats vicinity. At the time of the baptism, my ancestor was on parole from captivity; he did return to the Regiment a few months later at Ft. Stanwix. Another 1st NY soldier, Michael Wuterich, was baptismal sponsor for your ancestor Georg Bettinger, after the War. Both Michael and my ancestor and others had been captured by a British expedition at Sabbathday Point, NY, on March 19/20 1777, very shortly after they’d been mustered in to Capt. Graham’s Company of the 1st NY. Your ancestor was not among these captives. I also do not know of a genealogical connection between Wuterich/Widrig/Witterigs and your ancestral Philip Bettinger, but perhaps you do. Was there ever a 3rd installment as promised? Fascinated thus far… would like to see your further steps.